April 1, 2018 April 1, 2018 Categories Miniatures 1:12 Scale, Tutorials, UncategorizedDollhouse Easter, Easter miniatures, Easter printies, free printablesLeave a Comment on Easter Printables & Tutorials for Miniatures. The following images are vintage pieces from the public domain or they have been generously shared on these blogger’s websites. They are recommended for ‘personal use’ to use in your Easter projects. Please visit the blogger’s site (by clicking the link)to retrieve the image from them, rather than saving from my page. This page is for a curated purpose, so that I can point you in the direction of cute things I have found. I’ve included links to tutorials for an adorable Easter cart, mini eggs making, and baskets as well. Laurie Heisler has an easy video tutorial on making Easter baskets – they look very nice without the work of actually weaving them. If you click the link it takes you to her youtube tutorial. Laurie also has a video tutorial on making colourful Easter Eggs from clay. Just look at this marvelous peddler’s cart by Joann Swanson! This is the tutorial should you want to make one. You can see below that I modeled my sweets cart from her tutorial, with a few minor modifications. 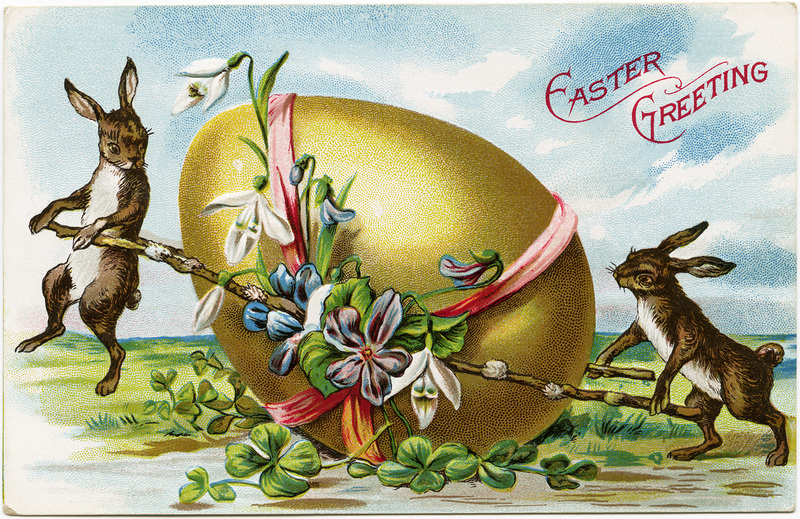 OldDesignShop.com has a vintage postcard that displays a sweet chick with Easter greetings just for you….. The same website has this pretty postcard…. The Graphics Fairy has oodles of Easter prettiness! 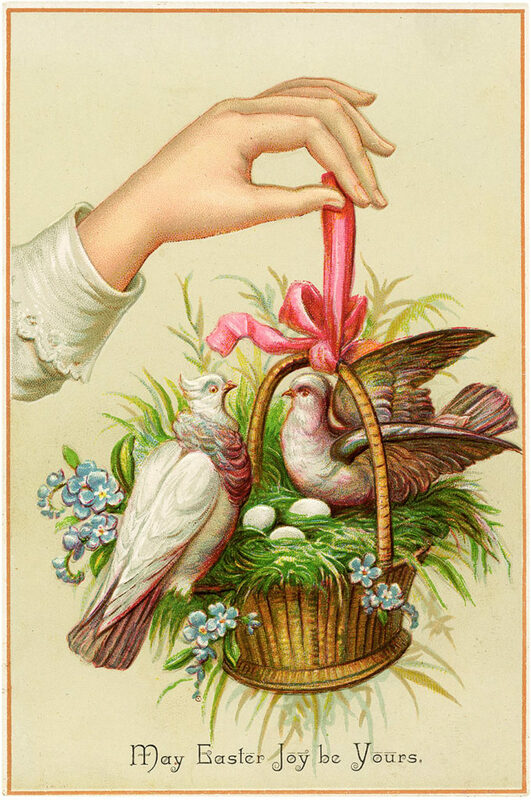 …and she has a collection of 30 favourite vintage Easter images for download located here. 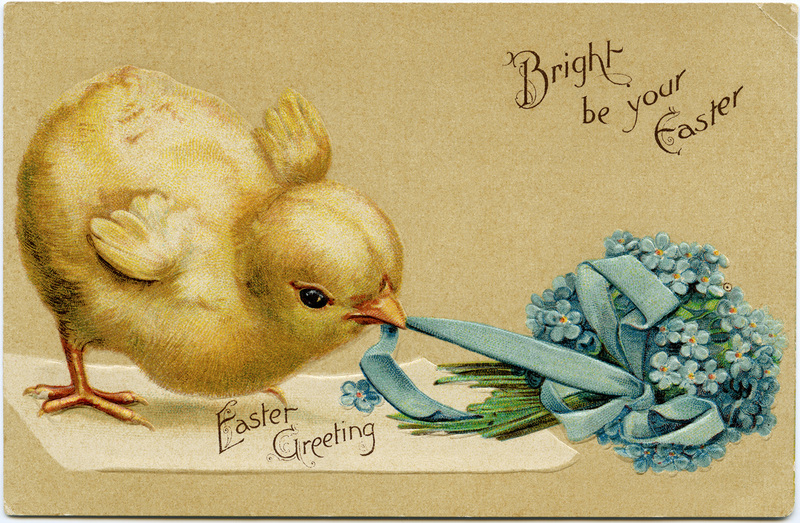 Whether observing this special holiday, or just enjoying some quiet family time… Happy Easter and peace to you all! Next Post My First Ball Jointed Doll!